Beautiful handmade jewellery by Stella Wardale. Designed and handmade in the UK using pearls, Swarowski Crystal, Paua Shells, Sterling Silver. Each piece is individually made to order. Bespoke jewellery service is available. Wedding jewellery incorporating Bridal Jewellery, Bridesmaids, Mother of the Bride. Constellation Beads UK and Beading with Stella Wardale offers unique beads of different types, metal pendants, shell, glass, Swarowski Crystal, wood, Czech Glass. Wires, tools, findings, cords etc are also available. 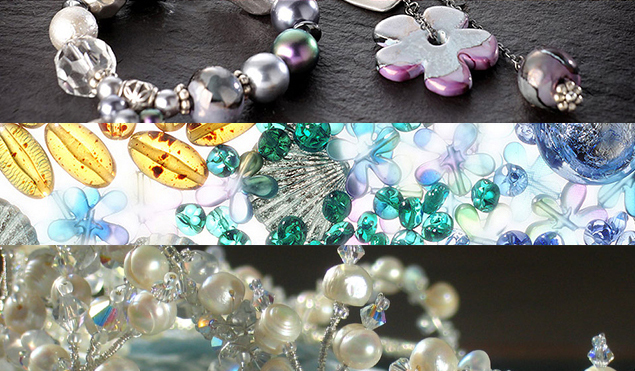 Stella Wardale gives beading classes and workshops as well as private tuition. You can also buy from the online shop. Constellation Beads UK offers a Beading Bar to entertain children at wedding receptions. Great for the discerning Beader. Stella Wardale and Andy Wardale combine to offer the perfect combination of beautiful handmade bespoke jewellery and mellow cello background music for your special day. Cello Duos. Trios and String Trios combining Violin Viola and Cello are also available options for you to choose from. Perfect background music for your wedding or event.